The solid residue left when combustible material is thoroughly burned or is oxidized by chemical means. An opening, usually with a hinge door and located at the bottom of the fireplace, through which ashes can be dumped. A storage compartment for ashes, located in the chimney base. A fan used to force air under pressure. An odorless, colorless, tasteless poisonous gas that is a byproduct of incomplete combustion. Toxic. The area around metal flue pipes, to simulate a chimney. The chase is usually built with wood or steel studs. Most common exterior covering is lathe and stucco. Other variations include brick/stone veneer or wood siding. One or more passageways, vertical or nearly so for conveying flue gases from the appliance to the outside atmosphere. A protective covering or housing for the top of a chimney intended for preventing the entry of rain, snow, animals, etc. 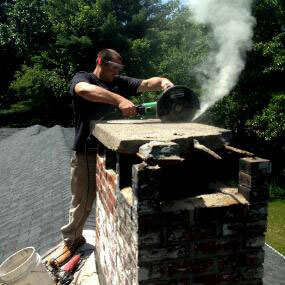 (Sweep) The process of removing soot, creosote, and debris from a chimney. This should be done on a regular basis in order for the chimney to operate as efficiently and safely as possible. The pipe connecting a fuel-burning appliance to a chimney. The inner portion of the chimney that contains the products of combustion. It can be made of clay tiles or of metal. For flues to be serviceable, they must remain in tact, free from perforations, cracks or damage of any kind that could allow the products of combustion to pass into the living spaces of the home, or the heat from the products of combustion to endanger combustible materials near the flue such as framing, walls, ceilings, insulation, or floors. Chimney and stovepipe deposits originating as condensed wood smoke. (also referred to as a Saddle) A ridge that extends from the back of the chimney to the slope of the roof, with the purpose of shedding water away from the connection between the chimney and the roof. (Chimney Safety Institute of America) The CSIA is a non-profit, tax-exempt educational institution dedicated to chimney and venting system safety. A valve, usually a movable or retractable plate, for controlling the flow of air or smoke. Double wall pipe where exhaust air is removed by the liner and combustion air is brought into the appliance between the inner liner and outer wall. The rising gas creates a pressure difference called draft, which draws combustion air into the appliance and expels the exhaust gas outside through the chimney. Chamber of a fireplace or stove where the fire actually burns. Brick composed of clay and silica and designed to withstand high temperatures such as those found in a firebox. Wood, coal, pellet, or gas heating appliances that fit inside an existing fireplace. Sheet metal or other materials used in waterproofing roof valleys or the angle between a chimney and a roof. The passage in a chimney for conveying flue gases to the outside atmosphere. Special liner required by codes and standards to cover the inner surface of the flue. The liner serves as a buffer between flue gases and chimney walls and is designed to contain the products of combustion. a gas burning appliance that burns propane or natural gas; the insert goes into an existing fireplace and creates a powerful heating source. The flue (venting) goes up through existing chimney and exhausts to the outside. Fireplaces that have either been converted from wood to gas or were constructed for gas. Most often their primary purpose is atmosphere rather than heat. Floor area within the firebox of a fireplace or a fireplace stove. Liner: The interior component of a double-wall chimney. A field-constructed chimney of bricks, stones or reinforced Portland cement concrete, lined with suitable chimney flue liners built in accordance with applicable building code requirements. A hearth and firebox of solid masonry units such as bricks, stones, listed masonry units, or reinforced concrete, provided with a suitable chimney. A single chimney containing more than one flue. National Fire Protection Association – an International Codes and Standards Organization. Small balls or blocks made of wood sawdust with no additives. A thin coat of mortar applied to the inside of a masonry chimney or to the walls of a smoke chamber. In reference to relining a chimney where pipe and insulation are placed through an existing flue that needs repair . Chamber in a fireplace directly above the smoke shelf and extending to the base of the flue. The area at the bottom of the smoke chamber created as the back wall of the firebox arches forward. The shelf is located at the intersection of the smoke chamber and the firebox. A damper is normally located on the forward side of the smoke shelf. A chimney cap designed to attach to and cover one clay tile flue. Soft, black, or brown, velvety carbon particle deposits inside appliances, chimneys or connectors, originating in oxygen-poor flames. The tendency for warmer air to rise within a structure, creating lower pressure in the lower areas of the building. Alteration to temperature inside a chimney or duct system that causes the metal surfaces to expand. Fixed or removable ring, tube, or lining usually located in the hole where the chimney connector passes through a wall and enters a chimney or vent. Opening above a fireplace firebox through which flue gases pass from the firebox to the flue. The fireplace damper frame assembly is usually located at the throat of a fireplace. (also called a top-mount damper) A device installed at the top of a chimney for the purpose of sealing the flue shut when the fireplace is not in use. They are often used as replacements for throat dampers that are installed just above the firebox when a masonry chimney is built. Top-sealing dampers are much more efficient than throat dampers because they provide a silicone rubber gasket seal rather than metal to metal. Term used relate to either a low BTU gas log or a gel fueled fireplace that does not require a flue or chimney for ventilation. All American Chimney Liner products carry specific certifications indicating satisfaction of safety standards set by Underwriters Laboratories. A continuous passage from the flue collar to the draft hood. Flue gas temperatures at the outlet do not exceed 600 degrees. Enclosed appliances, most commonly constructed of steel or cast-iron, used for burning wood for the purpose of heating an indoor space.